Christmas decorations using found, natural elements. 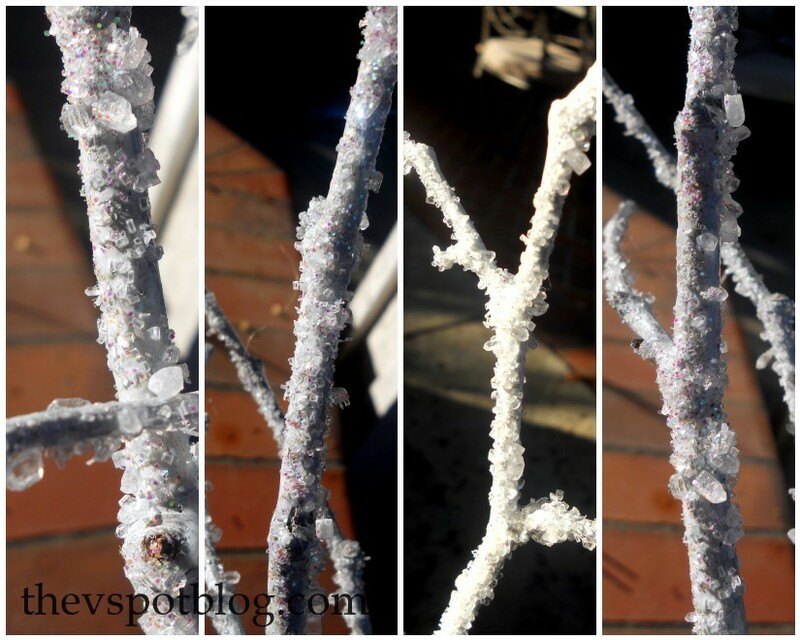 I love using natural elements in my Christmas decor and then “glamming” them up a little bit. Planning ahead during your next camping trip or vacation can have you sitting pretty come next Christmas. 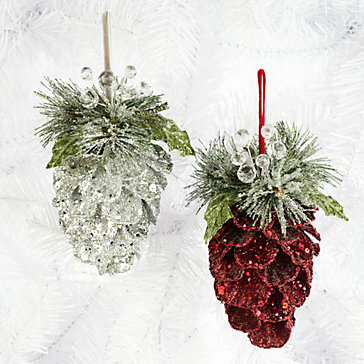 Adding paint, glitter and a little bling to a basic pine-cone can create something beautiful. There’s just something gorgeous when you combine the pine-cone’s rusticity with some sparkle. Leaving them au natural is beautiful too. I think this mirror is gorgeous. What about sticks and branches? I just did a tutorial on how to “frost” your own branches using epsom salt. One of my favorite things about using these natural elements is that, well, they’re free. We go camping all the time and there are all sorts of treasures to be found if you plan ahead. Let me say here and now that there are designated areas where it is illegal to take anything be it a pine-cone, a stick, a pebble… If you are camping in a state or national park you are probably not allowed to remove anything from the park. When in doubt, ASK. However, there are plenty of places where you can get these items with no restrictions whatsoever. We have gone camping where there were no restrictions on pine-cone collecting and I made Handsome Hubby cart home quite a few, knowing that come December I would have big plans for them. If you didn’t stock up on your last camping trip, you can always cruise your neighborhood…. I guarantee you that someone will have a “messy” tree of some kind and they will thank you for taking some of that “mess” off of their hands. What have you made with pine-cones, shells or sticks? Do you incorporate them into your holiday decor? There’s no doubt in my mind that my favorite element o all Christmas decor is the greenery. I collect mine from my yard. One of my favorite things about our neighborhood is that it’s an old, established place and is full of all kinds of trees. Right now I’m using magnolia leaves, magnolia seed pods, pine branches, pine cones, cypress, boxwood, holly, and arborvitae–all collected from my own yard! Does anyone know where to find hemlock bushes? I think they have mInature pine cones. I love that idea! When I have my own house again I plan on doing a natural elements theme with natural pieces, textures, and colors. Lovely pine cones!! This reminds me that I need to get some sticks and paint em!! I almost brought you an Oregon stick and pine cone…for your collection…then I thought maybe that would be lame balls. I drug home some sticks last night that I found while out walking my dog. My husband thinks I’m crazy. Glad to know there are other people out there just like me! I’ll have to try the Epsom salt treatment. I love that glittery pine cone in the top picture. I’d probably end up glittering myself instead…but it looks awesome! Oh wow, I love the pine cones in the first pic with all that glitter!!! 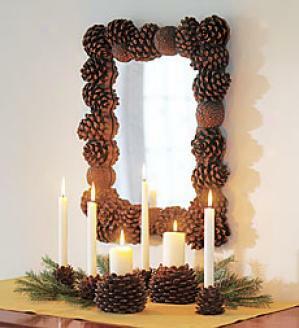 And the pine cone mirror is amazing! My kids bring pinecones and sticks home all the time from school and the park…so I guess I should stop tossing them over our fence in the backyard and try to do some crafts with them?? I came over from MiMi’s blog…love your word “smart-assery”. May have to borrow that term!! I have been decorating with pinecones from my backyard – wreaths, garland, ornaments and my centerpiece. I love the look. That mirror is gorgeous. So true, Viv! I even raid my neighbors’ yards for magnolia/holly etc (with permission of course). Have a great day! These are my favorite kind of decorations. I hate the fake crap. Great post. You do amazing things with sticks. <--that sounds dirty. Even better! LOVE, LOVE, LOVE those ideas. I MAKE WREATHS, LOVE THEM! For the glitter pinecones, did you use spray paint? I have used glitter spray paint and i have used clear sp adhes and glitter. Both give a totally different look.